The story of Gideon is once more a narrative about God’s punishment of the Israelites and His careful choice of a strong, devout figure to lead them to victory and freedom. As usual at this time they have reverted to worshipping idols for which they are made to suffer. After Deborah’s victory there are several decades of peace during which their sinful ways return. God chooses the seemingly undistinguished son of a small tribe to help His people. His name is Gideon. The neighbouring Midianites have begun waging war on the Israelites, and Gideon must lead an army against their much more experienced army. So he gathers a large force, which God thinks too great a number. The men are brought to the water to drink, and God tells Gideon to choose those who lap like animals when drinking to be his warriors.. Three hundred are thus chosen, and God promises them victory. After giving each man a torch and a horn, Gideon divides the three hundred into three companies, instructing them to follow his lead after they have taken their positions. 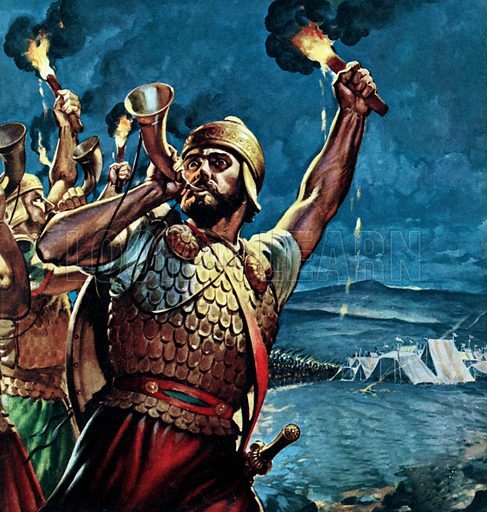 The war cry is then given and goes up, the three hundred rams-horn trumpets sound, and the Midianites begin to flee before turning on each other. Many more pictures relating to the Israelites and the Bible can be found at the Look and Learn picture library. Click on the link or picture to find out more about licensing pictures for commercial and educational use.